An electronic and mechanical subcontractor based in Coulsdon, Surrey U.K.We offer a fast and reliable service. No job too small. The web server with the IP-address 78.110.174.12 used by Chenterprise.co.uk is run by UK Dedicated Servers Limited and is located in Great Britain. 18 other websites are located on this web server. Most of them are provided in the english language. 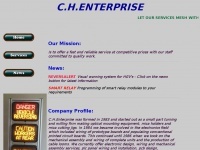 The websites of Chenterprise.co.uk are served by a Apache server. Due to the robot information on the webpage, the following actions by webcrawlers are not allowed: following the links.